Full view of the Hyman Condo in GTA Vice City. The Hyman Condo is a residential tower block in Downtown, Vice City, prominently used in Grand Theft Auto: Vice City as the player's safehouse. Located on the northwestern corner of Downtown Vice City, the condo is presumably named after the nearby Hyman Memorial Stadium, which is only located down the road to the west of the condo. The building is identifiable by its C-shaped upper structure, green and white facade, and a relatively well decorated rooftop (complete with a helipad, a satellite dish, and various other roof equipment). In GTA Vice City, the player may purchase the safehouse for $14,000 after unlocking mainland Vice City following "Phnom Penh '86"; the condo is actually available for purchase from the start as it is only a matter of being able to venture into the mainland using unconventional means. After purchase, the condo becomes a save point for the player. In addition, the player will have access to the condo's three garages, the western garage being capable of storing up to four cars, while the two garages to the east can store up to two cars each; storing more than the permitted numbers of vehicles will result in some of the stored vehicles disappearing. 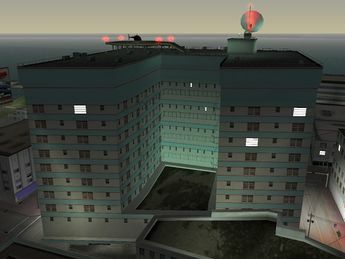 The player will also gain access to the building's rooftop, which helipad may spawn a Maverick (even before the player purchases the safehouse); hidden package weapons and items rewards will spawn on the roof, as is a change of clothes to Tommy's Street outfit. In conjunction with the condo's features in GTA Vice City, the driveway contains a police bribe, a Molotov Cocktail spawn at the Tacopalypse restaurant to the east of the safe house, and a dead end alleyway to the south contains a hidden package pickup. The exit to the east is partially blocked off with fold-up barricades, however these can be destroyed by driving through them at high speed. The Hyman Condo is present, largely unchanged but non-interactive, in Grand Theft Auto: Vice City Stories. A glitch specific to the original PlayStation 2 version involves hidden package rewards. Only weapons gained before you buy the condo will appear at the safehouse, to have all of the weapons at the safehouse, wait until you have collected at least 70 hidden packages before buying the condo. Ground level garages on the southern side of the condo, GTA Vice City. The rooftop of the condo, GTA Vice City. This page was last modified on 8 November 2012, at 08:22.